A two-way MS914 is the second by height and only slightly falls in MS906 by the energetic potential. 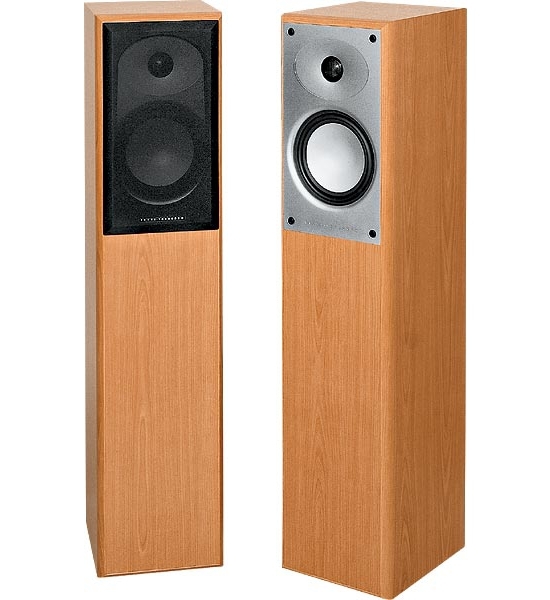 The construction of 914th is similar to the construction of smaller floor speaker system - MS904, but mid-high-range part of the specter in 914th is lighted by larger 165mm head (against 130 mm in the second one). The inverted dome of the aluminum diffuser of LF/MF driver is the product of the branded CPC technology (Continuous Profile Cone), aimed to the increase of radiation's efficiency and the elimination of parasiticbending disorders. A classic inch dome membrane of the tweeter is also made of aluminum. HF-radiation slightly orients a shallow horn in the space. For a greater reliability a heat-resistant voice coil of the tweeter is cooled by ferromagnetic fluid, also having useful damping properties. The body made of MDF is reinforced by the stiffeners; moreover, in the lower part of the construction there is the unit for filling by dusty ballast; the filling is made through the hole on the back panel (closed by a stopper) below the bas-reflex port. Strict and very neat appearance of MS914 must be noted, however inherent to each and every models of the series. Vinyl film coat is skillfully executed and it gas two color variants - "cherry" and black. Input terminals are gilt. The best qualities of sound images, creating by MS914 are clarity and detailing in the middle and high ranges of spectral space, leaving maximally pleasant impression at the moderate volume levels. The sound in this condition is comfort and informative. Tonal balance could be considered as absolutely neutral if not a relative low-frequency modesty of the system, sometimes causing the feeling of a bit lightened color. But any high-frequency accents are out of the question here - as they say, "you can't fault it": accuracy, punctuality, excellent resolution... We very liked how clearly, strictly differentially the tonal and articulatory parties of piano, saxophone and drums at the playing of phonogram with classic jazz were transferred. In the structural organization of the double-bass line the instruments, albeit inferior to voices, reliably performed their cementing role. Chamber forms, not overloading with dynamic hyperbolas, sound wonderful in the performance of MS914. In the lower part of the specter the layer of micro-dynamic nuances goes away a bit prematurely at pressing the volume down. On the other hand, sometimes you want more legibility in highly saturated sound arrays (for example, symphonic music). MS914 is good for small and medium size rooms (10-25 sq.m.). The variant of its use in the multi-channel system with participation of 900th series representatives is very interesting, and almost surely you will achieve non-trivial results in the composition with 2.1 music system, using for low-frequency provision one of the two subwoofers of the line - 907W or 909W.